AARRRHH ! Bala Catapults be at Bala! The pirate party lasted well into the Saturday night with drinks around the brazier made from an old washing machine. I remember John Terry with a parrot on his shoulder which later became the figure head on his boat. Cliff and Jo seemed in good form after drinking too many �Lazy Boys?� and meeting up with their old friends Ann and John Langford ? And what about the sailing? Oh yes we had thirteen Catapults thrashing about on the water. Nigel, Paul, Gareth, Stuart, Justin, Neal, George, Norman, Dave, John, Cliff, Tony and the England captain John Terry. Even though it is his first season sailing Catapults John Terry won the first two races until falling behind to a hull falling apart and then a mast falling down (I blame the parrot). 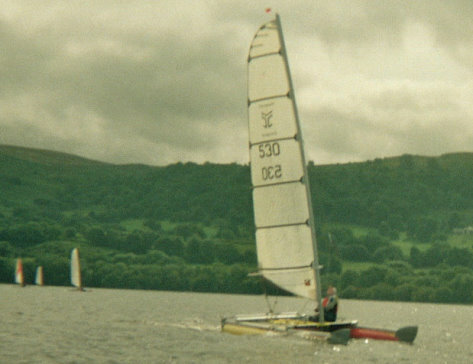 Jo kindly lent him a replacement hull so he could continue to compete. (Cliff still knows nothing about this, so keep it quiet) By then Paul and Gareth had got into their stride with a string of first and seconds. Gareth valiantly tried to manoeuvre off the spit shouting back �Can I get off and push?� , �No� was the reply, whilst this was happening Paul crossed the line and then most of the fleet , Gareth saw his first place evaporating in front of his eyes. To his great credit Don checked the rule book and realised that he was wrong �There has been an amendment��Good old Don, lucky Gareth, great amusement for all. The final placing in the serious racing was 1. Paul 2. Gareth 3. John T.
Now on to the more important stuff. Norman was paired with Stuart in the pair�s race and as the fleet approach the first mark in line abreast Stuart shouted out; �You don�t have to let them force you out Norman just shout �Water��. Norman then forced us all to luff up and at the same time as JT positioned himself between us and Tony. Chaos then ensued and Tony escaped unharmed to win the pairs race. You might need to know that in the pair�s race the faster sailor has to finish behind their partner. We thought this would encourage the better sailor to give on the water coaching (which it does) but this year Gareth and co realised that they could also bugga up the completion. It is a bit like American Football on the water. I may have the facts a bit unfair (Tony sailed very well) but it was great fun! The next important race was the Relay. Justin was hampered by a heavy crew (Steve Fenner) and did not stand a chance. My crew (Stephanie) was much lighter. Most unfairly, the others did not take crew! The wind dropped and Steph took over the helm (her first race) we overtook Gareth and Stuart by perfectly legal paddling but Stuart pipped us on the line to win by a yard. Tony had won again. The next important race was the team race. Tony and someone else won that too. A great weekend. Wonderful company. It would could only have been better if Chris, Barbara and Alastair had been there. Next time Tony please leave some prizes for the rest of us. Thanks to Stuart for all his hard work.